When you have troublesome and time-consuming home improvement tasks to accomplish, call Sears Handyman Services. They are skilled in a variety of tasks, from plumbing to deck building. For jobs that need attention all year round, get help from our expertly trained technicians. They can assist with all your minor to intermediate repair, improvement, and renovation needs. Give us a call at (720) 287-4411. Our handymen are skilled with installing recessed and LED lighting, as well as repairing and replacing ceiling fans and lighting fixtures. If you require these electrical tasks to be completed, call Sears Handyman Services. It may be hard for a homeowner to complete these jobs on their own and it's not always necessary to hire an electrician. Drywall is a common material in modern homes. It's reliably sturdy and portable; however, it's not immune to damage. Drywall is great for use in construction, but it does not stand up well against hard objects crashing into it or nail and screw punctures resulting from hanging items on the wall. If you need to patch, tape, repair, or hang drywall, Sears Handyman Services can help. Whether it's repairing existing material or hanging new drywall, our handymen are up to all minor and major drywall tasks. Gather your family on your deck for a nice relaxing summer day. If you have a deck, you know it takes a lot of hard work to keep up with its maintenance. Luckily, our handymen technicians can help you out. From wood rot to water damage protection, our technicians know how to do the job right. Additionally, they can assist with tasks like building new decks, staining, and so much more. 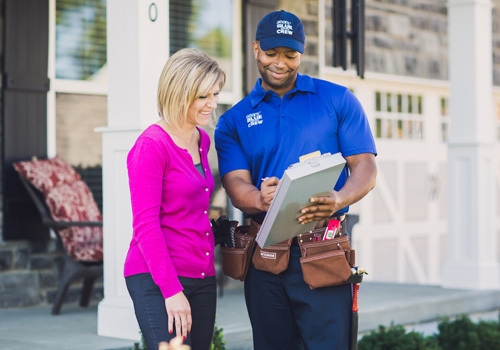 From privacy to picket fences, Sears Handyman Services knows how to install fences for you. If you want a chain link fence, which has more economic value, they can install that too. Fences are great for gaining privacy, marking your property line, and closing off your yard. If you need a new fence, all you have to do is call Sears Handyman Services. Let Sears Handyman Services help you rejuvenate your home inside and out with a fresh coat of paint. Painting the walls yourself can eat up a lot of your time, and you might find it hard dealing with ladders. When using a roller, it can still be difficult to reach those high walls and ceilings. Similarly, removing wallpaper can be a huge pain. For help with these painting tasks, and many others, simply hire our experienced handymen.